The Urban Bush Carpenters are bringing back old ways to help make a new world. We are bringing back a DIY ethic focused on sustainable living through growing your own food, making compost, keeping chooks and using worms to eat your food scraps. Like the bush-carpenters of old we use found wood to make useful things, the only difference is that we do it in the city. 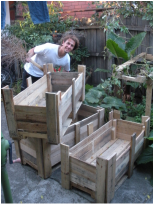 We find discarded timber around town, outside building sites, down alleys and in skips to make planter boxes, chookhouses, worm farms and compost bays for a range of community groups. You don’t need to bring materials, but ear plugs, covered shoes and gloves are a good idea. At the moment bookings are not necessary. $5 donation is requested. We’ll meet in the ‘Resource Hub’ space.